GET the GEAR: Ensure everyone has an avalanche transceiver, shovel, and probe on their person and knows how how to use them. GET the TRAINING: Take an avalanche class. Jan. 5, 2019 - Ride with and learn from Iron Dog Champion Chris Olds and the professional instructors at AAIC. This special one-day riders workshop has limited openings. Learn more and register. Jan. 26-27 - Thompson Pass Field workshops. Get location details at the 2-hour classroom session. Register for all three days Here! Thank you to HybridColor Productions WINTER PROJECT. 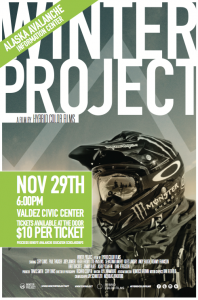 The Valdez showing raised $725 for the Mike O’Leary Avalanche Education Scholarship. This benefits rural riders who need financial assistance in taking their avalanche course. Check out THROTTLE DECISIONS: a video series for riding safety. Interesting article on riding mentors; Snowriders online. 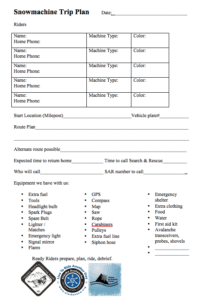 Give the gift of a lifetime, sign you and yours up for an avalanche class. Gain knowledge and skills that will help you LIVE TO RIDE ANOTHER DAY. What about Snow-bikes? A new and different way to play in the mountains. Snowmachine and Avalanche Safety Instructors needed! 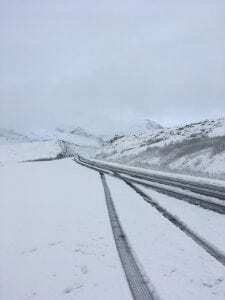 Alaska needs riders who share responsible mountain travel habits…become an instructor and help Alaskans LIVE TO RIDE ANOTHER DAY! Register for a snowmachine specific avalanche course near you! Snowmachines have the ability to cover significantly more terrain than other backcountry travelers. As a result, snowmachiners have the potential to expose themselves to much more avalanche terrain. Good routes and travel habits can reduce the risk of getting caught in a slide. Do you have the avalanche skills to live to ride another day? Think about your group…do they have the skills to dig you out? 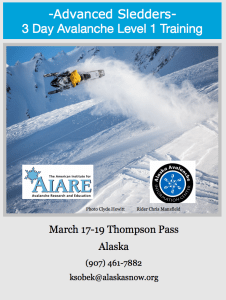 The Alaska Avalanche Information Center is working with AIARE to assist in the development of curriculum for snowmobile specific avalanche education in the US. We have been working towards this goal for several years, making headway towards the development and implementation of pertinent and effective avalanche education designed specifically for snowmobilers. If you have ideas or want to schedule a snowmachine specific class for your riding group or club, please contact us. 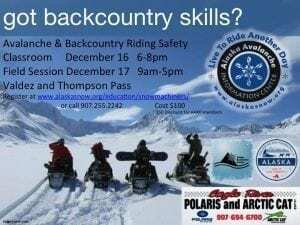 Thanks to Rich Loftin, Joe Rowe, Kyle Sobek and other Valdez Snowmachine Club members for making the Avalanche and Backcountry Riding Safety class at Thompson Pass a success December 17, 2016. Thanks for the FULL HOUSE turn out November 7, 2016 Avalanche and Backcountry Safety at Eagle River Polaris Arctic Cat. Special thanks to Paul Hughes for hosting.